These example sentences are selected automatically from various online news sources to reflect current usage of the word 'support level.' Views expressed in the examples do not represent the opinion of Merriam-Webster or its editors. Send us feedback. A support level is the price at which stock buyers jump in to purchase shares, establishing a floor beneath which it's difficult for the price to fall. Support, along with its cousin, resistance, are extremely important concepts in swing trading, and they are predicted by drawing horizontal trendlines on a stock price chart. These trendlines identify trading opportunities. At least two highs or two lows in the same area are required to create a support level. The pattern gains greater validity every time the stock "tests" price support levels by bouncing off of it. > R1-S2. TREN trends sharply downward. It finds support in early August at $35, where it then moves sideways, or "consolidates," for several days. > S2-R2. The shares rally briefly from roughly $35 to $40. Notice how we can connect R2 with S1 by using a straight line. What had been for a short time a support level has now turned into a resistance level. > R2-S3. Between mid-August and early September the shares drop precipitously, from $40 to $30. > S3-R3. The rally is brief. TREN recovers to $35. What had been support at S2, $35, has now turned into resistance at R3. > R3-S4. A mid-September decline takes TREN from $35 to $27. > S4-R4. 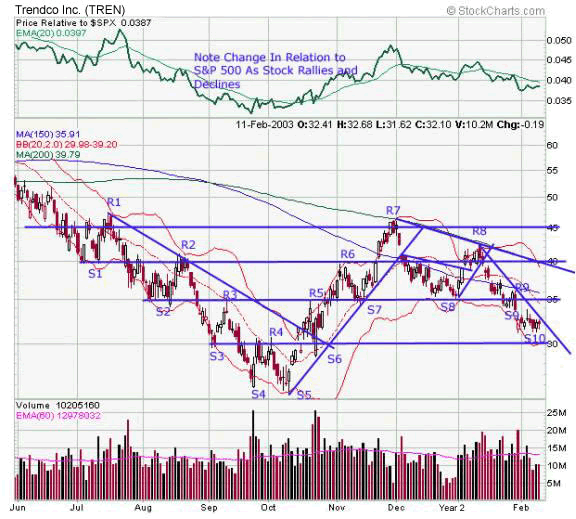 TREN pushes back to $30, the level at which it had previously found support (at S3). > R4-S5. The shares decline to their final early October low of just over $25. According to technical analysis, stock prices move within support and resistance levels. When these levels are broken, stocks are free to move into a new price pattern where new highs and new lows are established. Once a stock hits a support (floor) or resistance (ceiling) level, it can easily retrace in the opposite direction. Stock traders use prices determined by support levels to set stop loss orders on their trades. Swing Trading's 11 Commandments: Top Strategies for Technical Analysis -- 11 tips to execute winning trades. Swing Trading Support & Resistance -- learn two of the most important tools for analyzing a chart. How Swing Trader's Harness the Power of Trendlines -- detecting the trend is the most important skill in technical analysis. What made you want to look up support level? Please tell us where you read or heard it (including the quote, if possible).